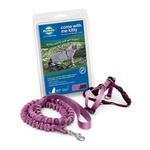 The Come With Me Kitty Harness and Bungee Leash in Dusty Rose & Burgundy helps your indoor kitty safely enjoy the great outdoors. Posted On 10/13/15 by Maegan B from Dallas, TX Yes, Maegan B recommends this product! Love this kitty leash. 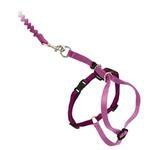 The bungee is what makes all the difference keeping the weight of the leash off their backs! The only reason I plan to return the item purchased was due to incorrect sizing on my part. I love BaxterBoo.com and plan to visit this site first for all my furry friend needs!